The company EDF EN Portugal is a subsidiary of the French Group, EDF Énergies Nouvelles, one of the world’s largest energy provider. With the headquarter located in Lisbon and the technical office in Esposende, the company successfully constructs and operates wind parks in the northern part of the Country. 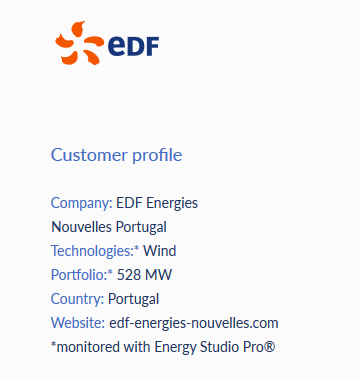 EDF EN Portugal as a leading player with its 500 MW of wind power monitored with Energy Studio Pro®, largely supported the zero emission milestone set in 2016 by Portugal, when for 107 hours the entire country has been powered by renewable energies. For the 2020 Portugal has set a goal of generating 45% of its energy from renewables. Given the increasing number of power plants and the growth of the installed power, EDF EN Portugal needed a central data hub for realizing powerful overviews and analysis of its wind parks. On top of this, our overriding concern was the ability to remotely manage important real-time data and alarms everywhere at any time. These crucial factors pushed EDF EN Portugal to look for the most flexible and powerful platform available in the market: that is where Energy Studio Pro® came in. the company’s experience and open philosophy in renewable energy and technology are two important pillars that differentiate BaxEnergy from other players in the market and this has greatly contributed to our choice. All in all, thanks to Energy Studio Pro®, we managed to accomplish our greatest challenge with success. EDF EN Portugal is using Energy Studio Pro® in its daily operations, by achieving immediate tangible improvements in terms of reaction time’s optimization, direct reduction of energy loss and increased return of the investment. Additionally, thanks to its friendly use automated tools Energy Studio Pro® allows the company’s personnel to quickly calculate the most common KPIs as well as to prepare advanced reports with ease. By looking back at the successful collaboration with BaxEnergy, Mr. Humberto Sousa highlights the future plans of the company to scale up with Energy Studio Pro®, by expanding the wind portfolio with the addition of other technologies such as solar power.